Braised, smoked or barbecued, brisket is a crowd-pleaser, which makes it a popular choice whether you're cooking for a weeknight family dinner, or entertaining a proverbial army. But let's face it, even a "small" brisket typically weighs 2 1/2 to 3 pounds, so there are invariably leftovers. And while it reheats brilliantly, you can only snag so many slices from the fridge, or throw together another plain old sandwich before boredom sets in. Fortunately, there are lots of delicious ways to transform that fork-tender meat. With inspiration like this, you may just find yourself making extra brisket on purpose. Brisket for breakfast? Why not?! 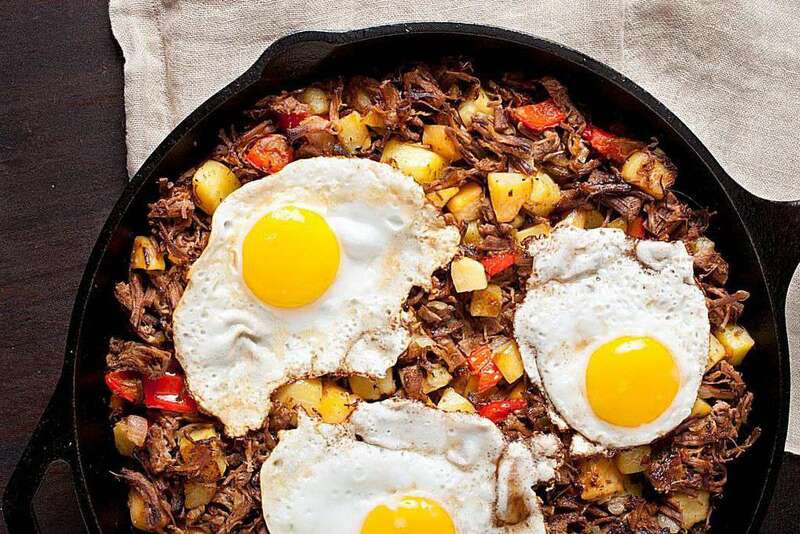 Barbecue and Grilling Expert Derrick Riches uses leftover barbecue brisket in this hearty hash, but leftover braised brisket would also work. Serve with some cornbread muffins and hot coffee, and you'll be well-fueled well into the day. Brisket makes a flavorful accent to nutritious whole grain and veggie bowls. The one pictured here features quinoa topped with steamed broccoli, roasted delicata squash, ginger sauerkraut, avocado and sriracha. But you can start with any grain - think farro, forbidden rice or kasha (with or without bowties). Add a variety of steamed and/or roasted veggies (leftovers work here too! ), and piquant accent like chutney or kimchi. Finish with a drizzle of tahini, a dash of hot sauce, or a favorite sauce or condiment. Think outside the pizza box, and use storebought or homemade pizza dough - which is almost always pareve - as a base for a brisket flatbread. Shape the dough into a large or small oval (depending on how many folks you're serving, and/or how much brisket you want to use up). Top with thinly sliced red onion, tomatoes, leftover brisket, and a drizzle of olive oil, as shown here. Or, get creative with toppings like roasted butternut squash, arugula and fresh herbs. Bake in a 425 F oven until the bottom is crisp and the toppings are cooked through. Want more recipe guidance (or a heartier, more pizza-like experience)? Add shredded brisket to this whole wheat vegan pizza. The onion, bell pepper, mushroom and tomato toppings are perfect complements to brisket. You won't miss the cheese (though you can add pareve vegan "cheese" if you want). Look to leftover brisket to turn your favorite greens into a satisfying entree salad. In spring or summer, when berries are abundant, add brisket to this simple strawberry and spinach salad. In winter, take advantage of gorgeous citrus fruits and make a salad like the one pictured here, which pairs the beef with blood orange, steamed asparagus, baby greens, and a simple Dijon-Balsamic vinaigrette. Arepas are corn-based cakes popular in Colombia and Venezuela that can be eaten solo or with a variety of fillings. While many traditional arepa recipes include cheese (which for kosher keepers, would make them a no-go with meat fillings), it's very easy to make them pareve (dairy-free). Just follow the directions on a bag of Maseca or P.A.N. - two kosher certified brands of precooked, instant corn masa flour. Mix it with water, shape into disks, pan fry, and you'll have the perfect vehicle for a snack of leftover brisket, avocado and hot sauce. While pork, tofu or chicken are more typical fillings, brisket would make a tasty riff on the Vietnamese sandwich banh mi. 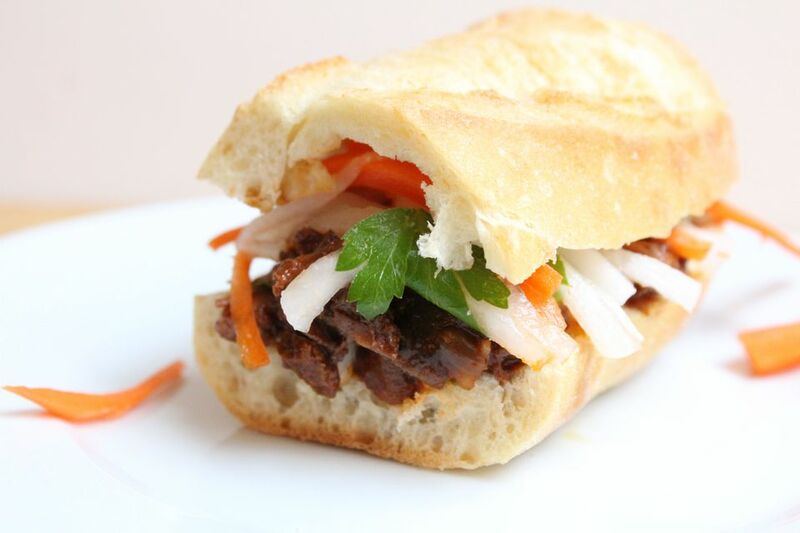 On her blog Viet World Kitchen, prolific cookbook author cooking instructor Andrea Nguyen offers an easy-to-follow master banh mi recipe (be sure to try her easy do chua! ), along with some fascinating history about the sandwich's evolution from a simple pate-smeared baguette to today's more elaborately layered versions. It may seem counterintuitive to start with a vegetarian chili recipe like this black bean version, but if you're adding leftover meat to the mix, it's a good idea to start with a base that's solidly flavorful all on it's own. That way, whether you've got a little brisket or a lot to use up, you can use it as an enhancement, without having to rely solely on the meat for fabulous flavor. If you've got a lot of leftover brisket to use up (or are just a fan of the meat-and-potatoes combo), a Shepherd's Pie is a good way to go. Replace the ground beef in this recipe with 1 1/2 to 2 pounds chopped or shredded brisket, and you'll have a satisfying weeknight meal that can feed the whole family.